Time for some fun with recessive genetics! 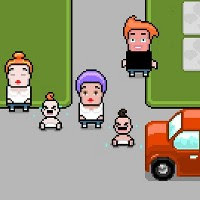 Ginger Dawn, developed by Oil Productions in conjunction with Playerthree, is a fun little action game with retro graphics that gives players a very specific objective – populate the world with as many red-headed babies as you can! First, you’ll choose whether or not your hero is male or female. (Your neighbors will all be of the opposite gender.) The game is broken down into seven levels, each representing one day of the week. By running into one of the other residents, and you’ll instantly produce offspring based on your combined genetics. Red-headed mates will automatically produce red-headed offspring; however, because red-headedness is a recessive genetic trait, pairing with a mate of different hair color may still generate a redheaded kid. Some neighbors may refuse to “get busy” with you immediately, but if you collect bagpipes you’ll temporarily increase your odds of acceptance. You’ll need to complete all of your philandering and return home before noon each day, lest the beating sun burns you to a crisp. (Collecting sunblock will extend your time limit by one hour.) With each passing day, the maps become bigger and more mazelike, your quota of redheaded offspring increases, and the number of neighbors with ginger pigmentation decreases. The last couple of levels are quite challenging. Ginger Dawn is a fun way to kill some time. It’s not incredibly deep, but is an accessible experience with decidedly tongue-in-cheek sensibilities. The recessive gene theme is well illustrated and fun, even when you start to realize that “responsible parenting” and “monogamy” aren’t in the main character’s vocabulary.